She’s an Oscar winner (former Oscar host) and one of the biggest fashion and film stars on the planet. Anne Hathaway returns to movie screens in “Serenity”, out this Thursday. That’s also the day studio Aviron is lifting the embargo on reviews. 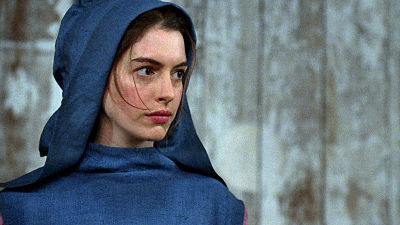 So for now, all I can say is that Hathaway, and the film, don’t disappoint. Voice performances are just as significant as live-action ones. Her Little Red Riding Hood is just one piece to the terrific puzzle that is this 2006 animated comedy (and the first film I ever reviewed). And it still holds up. I watch at least part of this 2006 rom-com anytime it’s on TV. And believe me, it’s on A LOT. There have been rumors about Hathaway reuniting with Meryl Streep, Emily Blunt and Stanley Tucci for a “Prada” follow-up – or another project. Hope they come true someday soon. Hathaway and Steve Carell made for a dynamite duo in this 2008 action comedy adaptation of the 60s TV series. Tack on Dwayne Johnson, Alan Arkin and Terrence Stamp and you get a great cast, paired with a smart, entertaining script. …but this is my personal No. 1. She’s simply stellar as a clothing website creator in Nancy Meyers’ 2015 comedy. Every scene with De Niro is top-notch. She pulls-off a particular, emotional one that instantly elevated “The Intern” to my “Best of” list that year. 2018’s female-driven reboot wasn’t perfect, but Hathaway easily delivered the best work of the ensemble as the devious Daphne Kluger. Very enjoyable to watch.